Combining a history of Iraq and its dominant sects with an acute awareness of the political machinations fomenting worldwide, this keen military analysis offers a practical exit strategy for U.S. armed forces in Iraq. Since the history of violence in multi-ethno-sectarian states indicates that such conflicts usually resurface once an occupying force leaves, a solution to end the violence and stabilize the country must be geographically reasonable for sectarian groupings. Ivan Eland explains why partitioning, a solution that has been successful in other chaotic political situations, can be a uniquely effective political and military exit strategy for a country like Iraq. Finally, Dr. Eland documents fifteen lessons that can be learned from previous partitions during the 20th and 21st centuries and applies them directly to the current situation in Iraq. In February 2009, President Barack Obama announced that he would withdraw most U.S. combat forces from Iraq by August 2010. If violence were to increase, he added, he would postpone the withdrawal. This proviso is telling: it not only indicates a realization that the reduction of violence since 2008 may be temporary, but it also suggests that U.S. troops could remain much longer than Obama promised during his presidential bid. Fortunately, although the prospects of renewed violence are high, the careful implementation of a decentralized government for Iraqone that lessens the conditions that could spark a full-scale civil warcould give all Iraqis a reasonable hope for a peaceful future. Iraq is an artificial country with only a recent national history. Mesopotamia was united for only 68 of the more than 1,300 years of Islamic rule in the Middle East between 600 CE and the creation of Iraq from three provinces by the British after World War I. Almost all of Iraqs tribal and ethno-sectarian groups place loyalty to their group above allegiance to the nation. This situation has made the Iraqi state dysfunctional from the start. Iraq might survive as a single country only if controlled by an iron-fisted ruler. Signs of Iraqs impending disintegration are already here. As much as 70 percent of Baghdad is segregated on a sectarian basis. The city now has a Shii eastern sector and a Sunni western sector. This may account for more of the reduction of violence in Iraq than the U.S. counterinsurgency strategy. By creating more homogeneous areas in many cities, prior ethnic cleansing, though horrible, has made potential partitioning easier. A ratified partition, with carefully drawn boundaries agreed upon by all groups, is necessary to keep the prior ethnic cleansing from erupting into full-blown civil war. Whether the Bush administration admitted it or not, its chief commander in Iraq, General David Petraeus, implicitly gave up on creating a unified democratic Iraq and recognized that stability required an acknowledgement of the fragmented reality on the ground. Petraeus trained Iraqi security forces, which are heavily infested with Shii militias. He did not challenge the Supreme Islamic Iraqi Council, which controlled most towns in the Shii south. He did not pursue the militant Shii militia of Moqtada al-Sadr, but instead aided al-Sadr by working with his group to provide aid and services in certain Shii areas and by pursuing only more radical renegade factions of that militia. Finally, Petraeus subsidized, armed, and trained former Sunni guerillas to police Sunni areas and fight al Qaeda. Thus, the United States will likely have trained and armed most of the factions in a multisided civil war. Critics of partitioning Iraq have used historical examplesprincipally the partitions of Ireland in 1921, the Punjab in 1947, and Palestine in 1948to attempt to discredit this solution. They allege that partition will increase violence and instability and lead to undemocratic outcomes. Yet even these violent partitions may have saved lives in the long term by at least partially separating the warring factions. In any event, the long-term violence was not caused by the partitions themselves, but by the fact that the partitions were incomplete. Moreover, the critics ignore many less celebrated successful, and even peaceful partitions, such as the partition of Bengal in 1947 and the division of Czechoslovakia into the Czech Republic and Slovakia in 1993. 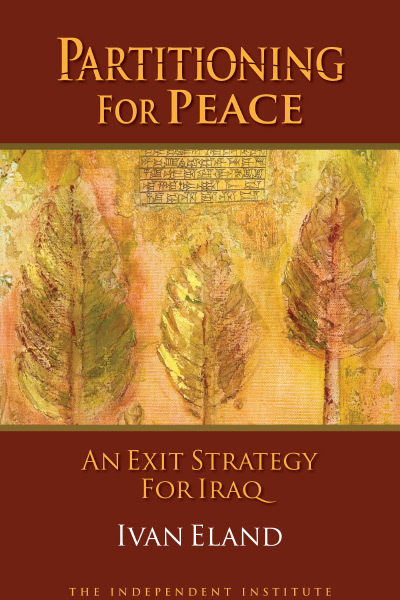 In Partitioning for Peace: An Exit Strategy for Iraq, Ivan Eland (Director and Senior Fellow, Center on Peace & Liberty, The Independent Institute) offers a practical strategy for extricating U.S. armed forces from the quagmire of Mesopotamia. Such an undertaking may be trickier than it seems: an ill-conceived withdrawal, some analysts claim, would create a power vacuum that could spark a civil war and possibly lead to the return of U.S. troops to Iraq. How might that outcome be avoided? The first step, Eland argues, is to recognize that Iraqs historically antagonistic religious and ethnic groups fear that if one group dominates the central government, it will exercise its power to the detriment of the others. The best option, therefore, is for Iraqis to create a decentralized form of government and to delegate to the national government only a few basic functions, such as conduct­ing foreign policy and ensuring free trade between regions. In some respects this process began after the fall of Saddam: Iraq moved toward a de facto partition as Arab Sunnis, Shia, and Kurds were forced to flee their neighbor­hoods and to seek strength in numbers. But this unratified partition is dangerous, Eland argues. A formal decentralizationde jure as well as de factocould provide greater stabil­ity and reduce the likelihood of a renewal of violence. Many observers are skeptical that such an arrangement could work, but Eland argues forcefully that partitioning represents the best hope for post-occupation Iraqif it is done correctly. After examining Iraqs tumultuous his­tory and the conditions that make it ripe for renewed civil strife, Eland offers fifteen historically based guidelines that must be heeded if Iraq is to become stable, peaceful, and secure. Partitioning for Peace begins with a review of the turbulent political history that char­acterized Mesopotamia from before the time of Ottoman rule up to the U.S. occupation. One recurring theme has profound implications for the future of Iraq: historically, the society was too fractured for centralized governmentexcept when it was ruled by an iron first. Mesopotamia lacked a cohesive political culture even before the Ottoman Turks con­quered it during the Safavid Persian Empire in 1536. The Ottomans piecemeal efforts to strengthen and standardize the rule of their empire led only to more political and social fragmentation in Mesopotamia. Ultimately they had to rely on decentralized methods, governing the land through regional leaders or tribal chiefs. Iraq has been a country only since the British, after World War I, artificially drew lines on a map and combined three disjointed former provinces of the defeated Ottoman EmpireMosul, Baghdad, and Basrainto the new League of Nationsmandated British protectorate of Mesopotamia (the name Iraq evolved later). In 1919 and 1920, the year the mandate was assigned to Britain, all of Iraq erupted in revolt, especially the Kurds and Shii tribes. The British occupiers, having too few forces to fight the fragmented rebel groups on the ground, responded to insurgent attacks by burning villages and crops and indiscrimi­nately bombing civilian areas. The 1930s marked a turning point of sorts: Britain signed the Anglo-Iraqi Treaty, allowing oil-rich Iraq to become a quasi-independent country in exchange for military bases and transit rights. That decade also saw the birth of Iraqi authoritarians who used armed forces to hold together the three disparate and fractious areas artificially in one country, a pattern that endured until the overthrow of Saddam Hussein. The U.S. decision to invade Iraq in 2003 ignored the serious complications that Iraqi disunity would impose during a post-war occupationa problem that experts an­ticipated before the war. Supporters of the invasion stated that governing post-Saddam Iraq would be comparable to the postwar occupation of Nazi Germany and Imperial Japan. In reality, the factors that enabled the Allies to administer those two countries after their defeat were absent from Iraq. The problem of disunity presents a ma­jor obstacle to the viability of a centralized Iraq. Insurgent groups appear to fight not only because they wish to rid the country of a foreign invader (Islamic doctrine calls for all Muslims to engage in defensive jihad whenever a Muslim country is attacked by a non-Muslim country), but they also fight because they believe doing so will help them establish a place in post-occupation Iraq. These problems are masked by the drop in violence that occurred after the U.S. troop surge began in 2007 which was largely caused by buying off Sunni insurgent groups and reaching a fragile truce with Shii militias. Nevertheless, long-standing grievances and suspicions between Sunnis, Shia, and Kurds remain and are likely to intensify if corrective measures are not undertaken. Above all, such measures must recognize that restructuring Iraq at the point of a gun will not work. Guerilla warfare is often a los­ing game for a foreign occupier and usually for a divided government that is propped up by a foreign power. Reducing violence for the long term requires that Iraqis convene a constitutional conven­tion with representation from each of the countrys regions, tribes, and ethnic and sectarian groups, and without the taint of Western interference, which would under­mine its perceived legitimacy. The outcome of such a convention would likely be some form of decentralized governmenta partition, confederation, or combination of the two. Under a confederation, Iraqs central government would have less power than the component states, which would be ruled autonomously by Kurds, Arab Sunnis, and Shia, and possibly have additional, nar­rower ethnic and tribal divisions. The central government might decide only matters of economic policy, leaving the states to decide potentially divisive issues such as policing, defense, foreign policy, and social policy. A secession clause would discourage the central government from growing too large and powerful. The longer it takes to establish a viable Iraqi central government, the more likely that a partition will result. Some critics fear that if Iraq were partitioned, the new countries would not be viable and/or that neighboring countries would intervene in their affairs. Eland addresses these criticisms and notes that the critics have not offered a better alternative. Permitting Iraq to have self-determinationand likely a decentralized form of governance, or even complete partitionis not a perfect solution, but it is very probably the best way out of what has become an ill-advised military adventure, writes Eland. If left uncorrected, Iraqs de facto partition will likely lead to territorial disputes and fears of large minorities caught on the wrong side of the dividing linesculminating in an all-out multisided civil war. To prevent this from occurring, new boundaries must be drawn and ratified by all ethno-sectarian and tribal groups. How should this be brought about? The twentieth centurys partitions and secessionssome successful, some dismal failuresoffer important lessons that might bring lasting peace to Iraq. Eland discusses fifteen of them. The most important lesson of past par­titions is that all parties must be in agreement with the partition or conflict will result, writes Eland. The failure to heed that lesson contrib­uted to the Israeli-Arab conflict, the invasion of Poland by Nazi Germany, and violence between Muslims and Sikhs on the Indian subcontinent. Fortunately, in the case of Iraq, each group would have incentives to favor a partition if they believed the outcome would be effective and equitable. Boundaries must avoid stranding large minorities on the wrong side. Northern Ireland was long plagued by violence partly because Irelands partitioning in 1921 left a large Catholic minority among the Protestant majority in the north. To solve the security dilemma posed by mixed demography, it is not necessary for every member of an ethno-sectarian group to live behind the same divid­ing line: if only a small minority remains on the other side, the majority population will not feel threatened and the prospects for peace are greatly enhanced. Population movements must be voluntary and secure. Even with the best-drawn bor­ders, some population movements may be necessary. To encourage groups of people to move, the Iraqi government or some other entity could offer them monetary incentives. Security of passage established by an inter­national peacekeeping force could eliminate the possibility of widespread violence such as occurred during the partition of the Indian subcontinent in 1947. Powerful neighbors must participate in the partition process. When Bosnia was par­titioned, the leaders of neighboring Serbia and Croatia were wisely brought into the negotiation of the Dayton Agreement. In the case of Iraq, surrounding countries with stakes in an Iraqi partitionJordan, Saudi Arabia, Turkey, Syria, and Iranshould be included in the negotiations. This would greatly reduce the prospect of a partition causing international conflict. According to Eland, the Shii-Kurd govern­ment has no incentive to reconcile with the Sunnis. This could change should the United States announce a full and rapid withdrawal of all foreign troops by a certain date. This announcement must be highly credible so that Iraqis would believe that not quickly creating the necessary institutions would have the gravest consequences for their society. "With his new book, Partitioning for Peace: An Exit Strategy for Iraq, Ivan Eland, director of the Center on Peace and Liberty at the Oakland-based Independent Institute, has pretty much convinced me that a partition plan is the least-worst approach to a post-occupation Iraq. Perhaps paradoxically, he has also convinced me that what he or I or any American thinks should not be imposed on Iraq, but that the Iraqi people, as free as possible from any outside power, will have to make the decision in order for it to stick. Obviously, his book is an attempt at strong persuasion, but the bottom line is that it will have to be an Iraqi decision. . . . Mr. Eland acknowledges that partition will not be easy, and a certain amount of bloodshed, hard bargaining and subsidized voluntary migration might be involved. He offers 15 guidelines for those seeking a confederation (modeled after the European Union) rather than a federal state or separate states, stressing the importance of consent and possible oil revenue sharing. I hope some people in Iraq are reading this book."